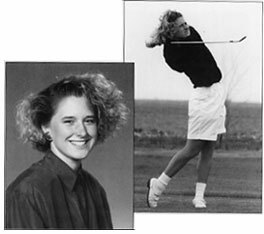 Renee Heiken Slone burst onto the local sports scene as a sophomore at Metamora High in 1987 by winning the IHSA individual girls golf title, a feat she repeated as a senior at the 1989 meet. Renee further astonished the golf world by winning an unprecedented four consecutive Peoria Women's City titles from 1987 - 1990. A scholarship athlete playing for the University of Illinois, she won individual Big Ten titles in 1991 and 1993. Heiken was selected as the U. of I. Female Athlete of the Year in 1991 and repeated in 1992 as co-winner. She garnered All-American honors three consecutive years, 1991 through 1993, and was the 1993 College Player of the Year.